Kansans have experienced four tax increases in the past four years. Governor Kelly intends to apply a fifth tax increase by denying Kansans the full benefits of federal tax reform. Now the January government tax report shows holiday sales fell by $85 million. Kansans have held back spending for seven straight months. 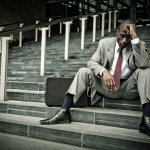 The trend suggests they may not feel confident about their financial future. See the December Fiscal Year 2019 Report here. 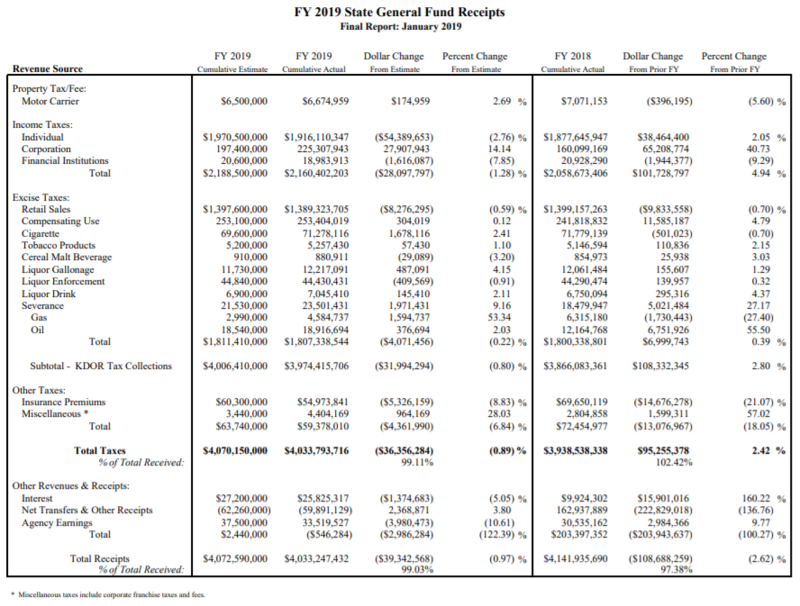 The Governor’s Budget Office reported state government tax collections were $95 million above the same time last fiscal year (see chart below). This $95 million is $100 million LESS THAN the December report of $196 million. That means government saw a decrease of $100 million in revenue collections, primarily driven by income tax collection declines. What is the cause of the drastic drop in income tax for the month? The answer could be the federal Tax Cuts and Jobs Act (TCJA). When passed in December 2017, the TCJA placed a limit on the amount of state and local taxes people can deduct on their federal return. The cap was to take effect in 2018. Many taxpayers rushed to make their property and business income tax payments before the ceiling took effect. This unique shift in tax payments could explain why income tax revenues this year are relatively low, thus far. Time will tell whether the drop-in income tax is a one-time event or the start of a larger trend. What is a larger trend is that purchasing of Kansas retail goods subject to sales tax has been shrinking. National data for retail sales this December has yet to be released. However information from November and prior months detailed Americans by and large are bolstering their spending habits. It seems there’s some factor affecting Kansans’ shopping habits and it’s not in play on the national stage. Perhaps state fiscal policy plays some role. Current state fiscal policy may adversely affect Kansans’ willingness to spend. Despite frequent tax increases, the state budget still doesn’t have the reserves to support proposed Medicaid expansion or the extra $477 million in state spending. These state spending plans grow the budget shortfall and make future tax increases more likely. The greater the chance of tax hikes tomorrow, the greater the chance Kansans slow their shopping today. Additionally, more Kansans may be encouraged to seek opportunities elsewhere, continuing the vicious cycle of economic stagnation.